Under this scheme, a state government will give Rs 10000 as a monthly pension to each media professionals. On the day of launch, chief minister of Haryana, Shri Manohar Lal Khattar has given a cheque of Rs 100000 to 10 veteran media professionals as a pension. To give pension to media professionals in a state. 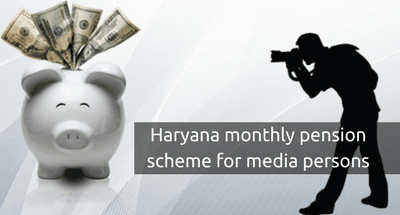 The Haryana state government will give pension to those selected media persons who are either working daily or evening or weekly or fortnightly or monthly newspapers. The state government also give pension to those who work with news magazines, agencies, news channels and radio stations. Under this scheme, a Haryana state government has some eligibility criteria to avail benefit of this scheme. A beneficiary must have been accredited with details in the language department, PR sectors and information in the Haryana state for the last 5 years. An acclamation will be given to those who have completed 5 years in media profession and it is given by the sub-divisional member of online news portals. A beneficiary must have a valid Aadhar card which is linked to the saving bank account in a nationalised bank to deposit directly pension amount into the account. A pensioner has to give a certificate in the month of January every. Media professionals who are getting pension or honorarium from any other state government or news organisation are also eligible under this scheme. In case of demise of pensioner media professional, his spouse will get this monthly pension of Rs 10000 is she or he is not getting any kind of salary, wages, pension or any other type of regular source of income from a state or central government or any other organization. If the pensioner is getting the benefit of the pension of less than Rs.10, 000 per month, the entitlement of pension under this scheme would be decreased by that much amount. The Haryana state government will give Rs 10000 as a pension to each media professionals who qualified the eligibility criteria. Along with it, the Haryana state government has also launched a policy of life insurance worth Rs 10 lakh and a Rs 5 lakh health insurance policy. The media professional will get a health insurance of Rs 5 lakh and life insurance of Rs 10 lakh by paying 50% of the premium amount and the remaining 50% is paid by the State government. This is not the first time that Haryana government come up with a new trend or a scheme. Before this, the state government has also launched many schemes like pension to widower and widowers, pension to disabled people, pension to senior citizen. The Haryana state government is constantly making efforts to bring change in a state and make a life of a people prosperous.